I just started creating my first game. I will be using the Unity Engine to power the game and 3ds Max and Photoshop (if I need textures at all) for asset creation. Working title is ‘Void()’. Story is about a computer program tasked with eliminating intruders in a system. 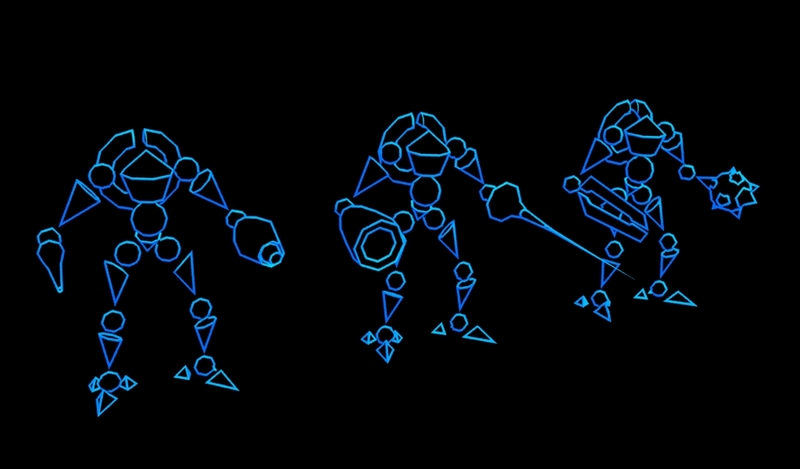 From left to right: Laser, Blaster, Plasma, Lance, Sword, Mace. I hope I can create a similar look with Unity Shaders. Gameplay-wise it will feature what I call real-time-turn-based combat. The player can move in real-time and the enemies will move at the same time, but when the player doesn’t do anything, everything else will stand still, including explosions and projectiles. It would allow the player to choose between fast and tactical gameplay on the fly.